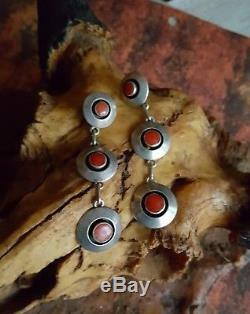 JEWELRY HOARDER'S NATIVE AMERICAN NAVAJO STERLING SILVER AND CORAL DANGLE PIERCED EARRINGS. 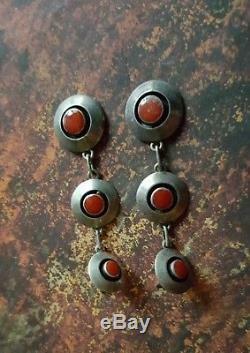 Offered here is a pair of genuine Navajo sterling and coral earrings. These are quite old and authentic Navajo tribal pieces with a BIG BOLD LOOK. My mother did have the matching Squash Blossom necklace, bracelet and ring but these were given to a relative years ago who did not have pierced ears. I claimed the earrings and enjoyed wearing them for years. Now they just sit in one of my jewelry boxes unworn and ignored so I decided to pass them onto another to enjoy them too. They could use a good cleaning and a polish but I will leave that up to the new owner. PLEASE USE PICTURES AS PART OF DESCRIPTION FOR ANY CONDITION ISSUES NOT MENTIONED! SIZE, WEIGHT OR MEASUREMENTS: 2.5 inches long and 11 GRAMS. CONFESSIONS OF A JEWELRY HOARDER. Yes, its time to stop the obsession, OR, at least control it a bit. We admit it, or at least SOME of us do. My sisters and I are'jewelry hoarders'! We just can't pass up a good bargain on a sparkly treasure, especially one that speaks' to us or is part of a current favorite type. Box full of jewelry at an estate sale? Of course we come by it naturally, our mother was a jewelry hoarder too. We were raised on yard and estate sales, church rummage and tag sales, country farm and estate liquidation auctions. This was our family fun for as long as we can remember. I was in heaven and the price? Of course this was the early 60's so a dollar went a lot further than it does now LOL! I will confess that one of us once bought EIGHT plastic garbage cans, yes, BIG plastic garbage BARRELS (you know, the big outdoor ones with lids) full of jewelry at an estate sale of an actual hoarder. Oh the orgasmic joy as we dumped them one by one to sort out the sparkly, glittering, glowing treasures! One of us, I won't say which, actually has an entire ROOM devoted to the storage of her MASSIVE jewelry collection and the other two are not far behind! Some of these pieces we have loved and worn, some we have fondled and admired and some have just set in our many boxes waiting on the right person to love them. But listing takes a long time when you do many pictures, research and write up listings. We will still do those listings for special treasures but our "JEWELRY HOARDER" listings will be much simpler. One or two pictures, no flowery or researched description. Simply a title, the picture and weight and/or size or measurements. Most pieces might need a good cleaning or a polishing. Unless it is noted at top of listing you can assume all pieces are in decent vintage condition with some possible signs of wear. We described the item to the best of our abilities! Please refer to the many pictures and ask questions if in doubt or more info is needed. My two sisters and I are all downsizing significantly as well as sorting out our parent's estate so keep watch here for lots of new listings from us! We are all collectors who come from a family of collectors and we have some wonderful and rare items to list. Please pay within 3 days. While we strive to protect our customers from excess charges, any packages sent insured will show full value. 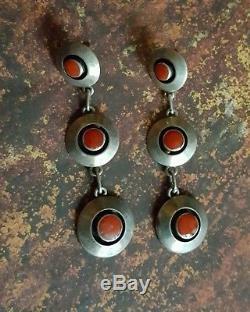 The item "BIG Vintage Native American NAVAJO Coral Sterling Silver Dangle Pierced Earrings" is in sale since Wednesday, December 20, 2017. This item is in the category "Jewelry & Watches\Ethnic, Regional & Tribal\Native American\Earrings". The seller is "tecielee" and is located in Olivehurst, California. This item can be shipped worldwide.